Having a home appraisal can be helpful on many levels. Not only can you see the value of your home at any given time, but you can understand what you get for it if you decide to sell. While you may be curious as to what your home may be worth, paying out of pocket for a home appraisal doesn’t sound that appealing. No one wants to shell out bucks for a quick assessment of the value of their home. But there are several ways that you can get a free home appraisal without having to dig deep into your savings to do so. With these handy free home appraisal sites, you can receive an estimate of your home’s worth without having to make an appointment or more importantly pay anything. Check out these sites for free home appraisals so you can finally find out what your home is worth at no cost to you. If you are looking for even more money-making tips, try these easy ways to make extra money. Zillow is a great site to find out the value of your home. You virtually use this online site to look of the value of any home, which is great if you are a buyer or a seller of a property. By simply typing in your address, you can locate your home with all the specifications from the last time it was listed on the market. The site will list all the amenities of your home as well as have photos of its interior and exterior. The real magic of Zillow is what is called the Zestimate. This gives you the free home appraisal value. The Zestimate shows you what your home is worth if you would sell it today. This is a good way to estimate exactly what your sale price should be if you were to sell your house for the top price. The Zestimate allows you to get a good idea of your home’s value and what to list it as if you were to sell it. It also shows you the change in value over the last 30 days so you can see if your home value goes up or down month-to-month. Through the power of the Zestimate, you can also search your neighbor’s properties to see where your home stacks up in terms of worth. You can compare home values in your neighborhood and price yours according to the total value of the community where you live. Not ready to sell yet? Click here to find out how much you can make if you rent out your property via Airbnb! Another site where you can get a free home appraisal estimate is RedFin. This site is dedicated to sellers looking to offload a property as well as buyers looking to purchase a new home. With RedFin, you can easily see the value of your home with a few simple clicks. You just need to go into the seller tools on the site and enter your home’s address. Here, you will be directed to another page that will list your home value immediately. Your RedFin Estimate is listed along with the specs of your home, giving you a good overview of what you stand to make on your property if you would sell it today. Now, RedFin has another nice feature as you can easily check the home values of your neighbors to see where your home stacks up. This can give you a good idea if your home is under market value or right inline for the neighborhood that you live in. RedFin also allows you to sign up for alerts that will notify you when your home estimate changes. This can keep you informed and let you know when a good time to sell is. To make money on more than your home, click here to try these tips. Now, if you are looking for another way to get a free home appraisal estimate, you may want to check out Trulia. Trulia is another site that can provide you with an inside glimpse into the value of your home. It too includes an appraisal estimate of your home so you can see the worth just by entering in your address. With Trulia, you will be directed to the page of your home, which includes pictures, basic specifications, and most importantly your free home appraisal. The Trulia Estimate will tell you exactly what your home is worth should you decide to put it on the market right now. Trulia is a good site to see how your home compares to others that are currently for sale. This is a great tool if you are contemplating selling your home and need to see what houses like yours are currently listed at. With Trulia, you can get a free home appraisal right from the comfort of your home with a few simple clicks of the mouse. For even more ways to save money, checkout this amazing and fun savings platform: Long Game. Now, Realtor.com will give you even more details about what you stand to make if you are considering selling your home. The free home appraisal site lets you input your address and pulls up the recommended sale price, which is your appraisal estimate. The nice part of using Realtor.com is the ability to see what it will cost you to sell your home as well as how much your home value will raise based on the improvements you have made to it. You can also factor in realtor commission and transfer tax to really see what you stand to make on your home’s sale. The site even gets more detailed showing you the market value of homes in your area as well as the square footage price of your home. A nice feature should you decide to sell your home is the number of days that houses in your area have been on the market. This can give you a good idea of how long it will take you to sell your house should you put it up for sale. You’ll also get a look at the average price of comparable homes in your neighborhood, so you will be well informed of your house’s total value without spending a dime for a home appraisal. Did you know you could save more money in the long term by losing weight and getting healthy? Sign up for HealthyWage to find out how. For sellers that want a quick and easy free home appraisal, you can click over to Eppraisal.com. This free home appraisal site will give you a comparison of your home’s value with an estimate value. You’ll be able to see what your home value is through Eppraisal.com as well as your home’s specs and yearly taxes. Eppraisal.com also hooks you up with lenders if you are a buyer looking to purchase a home. You can instantly request a loan amount and calculate your total payment. With Eppraisal.com you’ll have a good idea as a buyer or seller what a home you are either looking to buy or sell is worth. The site is a good way to also see nearby home values as well as what schools your children may attend if you live there. If you want another way to make money without having to sell your home, try these tips. Chase Mortgage Services is another site where you can take advantage of receiving a free home appraisal. The site allows you to enter in your home’s address and make adjustments on the specifications of the home as well as the improvements you have made to it. This will allow you to really customize your home appraisal, especially if you have done work on it to improve its total value. By using the Chase free home appraisal calculator, you can see what your home sold for previously, which is a great feature if you are looking to buy a home for the best price. With Chase’s home appraisal option, you will have a good view of the value of your home based on its improvements and enhancements. This can provide you the information you need to make a sound decision on the sale price if you are considering selling your home as soon as possible. It is also a good tool to help you see if the improvements that you want to make to your home will pay your back when you do decide to sell it. Another site where you can find a free home appraisal estimate is with ForSaleByOwner.com. With ForSaleByOwner.com, you can enter your home’s address, and it will direct you to your very own appraisal estimate. You’ll see what your home is worth as well as the details of your home’s layout such as the number of bedrooms and baths. ForSaleByOwner.com also lists your total square footage should you need this information. The site will provide you a sliding scale for your home appraisal as it shows the median value as well as the low and high value. This can be rather helpful, depending on the demand of the real estate market at the time that you decide to sell. Also, included on ForSaleByOwner.com is a look at the home values of other houses near to yours. You will get a really good look into how your house compares to your neighbors in terms of size, amenities, and value. This would be valuable if you are looking to sell your home at a comparable price or want to get top dollar for your house sale. Want more ways to make money? Try these helpful tips that can make you money fast. Real Estate ABC is another site where you can easily find out what your home is worth. It offers a free home appraisal that will provide you with all the information you need to sell or buy a property. With Real Estate ABC, you just have to enter in your home address. Click search, and you will be taken to a plethora of information on your property. Real Estate ABC lists your home estimate and provides details about square footage. The site also lists the last sale price of your home, which can give you a good idea of the value of the home now versus when you bought it. It can also provide a seller with an idea of what a home is worth based on the estimate provided and the last sale price. By listing the last price sold of a home, a buyer can tell if major improvements have been made to increase its appraisal estimate or if you are planning on purchasing a property that is not worth what you have offered. You can easily see how your home compares to other houses near you as Real Estate ABC lists a number of homes in your area. It also gives a history of home values over time so you can see what houses have sold over time, so you know where your property stacks up in comparison. Real Estate ABC is a good site if you are looking for a more detailed free home appraisal. For more tips on what to look for when purchasing a property, check out our article on real estate investing for beginners. Lastly, if you want to get a free home appraisal estimate from an actual real estate company, you’ll want to head on over to RE/MAX. RE/MAX does a good job of providing a lot of information about a property’s value. With its estimate, you can discover exactly what your home is worth. The site uses a Google Maps to guide you into a street view so you can really see where a home is located and what it looks like. RE/MAX provides your home’s estimate as well as the specifications for the house. As you further down the page, you will find that there is a detailed market analysis of the value of a home over time, showing you when the best time to buy or sell really is. You’ll also have access to other home values in the neighborhood as well as demographics and school information, which is a nice feature if you are looking to move as a family. RE/MAX gives buyers and sellers a look at past sale prices so you can see how your home value has increased over time. The RE/MAX site is a great tool if you want to dig deep to see what your home is worth and connect with a real estate agent at the same time. If you are looking to make some extra money to fund the purchase of a new home, try these tips by clicking here. 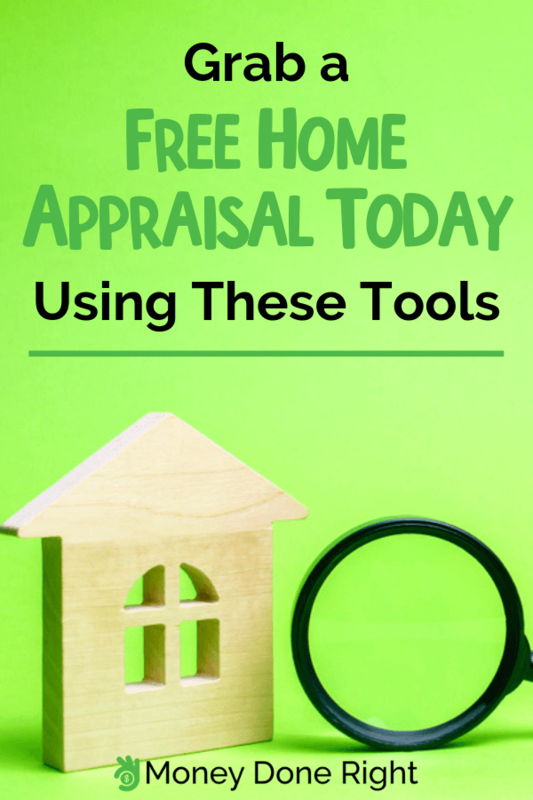 As you can see, there are several ways to get a free home appraisal with these easy-to-use tools. Not only will you see the value of your home today, but you will have access to other valuable information that can help you as a buyer or seller. If you are looking to find out what your home is worth, try one of these sites for your free home appraisal estimates. Have questions about how free home appraisals works? Ask us! Or, do you know of another free home appraisal site? Let us know. We want to hear from you. Also, be sure to check out these great ways to make some extra money. We guarantee you won’t be disappointed.